Mundane Monday to you all, my little gingersnaps. Thank you for your patience as I've totally slacked off by not posting. But today I'm back!! Let's get on with it, shall we? "one Pizza Hut medium Super Supreme Deep Dish pizza, double portion, with mushrooms, onions, jalapeno peppers, and pepperoni; pizza, regular portion, with three cheeses, olives, bell pepper, tomato, garlic and Italian sausage; 10 8-oz. packs of Parmesan cheese; 10 8-oz. packs of ranch dressing; one family size bag of Doritos nacho cheese flavor; 8 oz. jalapeno nacho cheese; 4 oz. sliced jalapenos; two large strawberry shakes; two 20-oz. cherry Cokes; one super-size order of McDonald's fries with extra ketchup and mayonnaise; and two pints of strawberry ice cream"
I'm not sure I'd disagree with ordering a huge meal of comfort food if I were about to be executed. My meal? Well it would have to include a large fountain Dr Pepper. Possibly then a pepperoni and bell pepper pizza (Round Table Pizza) accompanied by a bottle of Blackstone Merlot. Not sure that would be up to 30,000 calories, but I sure would be satisfied for my final meal. And possibly drunk. A convicted murderer on death row was executed on Wednesday but for his last meal he ordered a whopping 29,000 calorie dinner! Gary “The Butcher” Carl Simmons, 49, was given his last meal at the Mississippi State Penitentiary in Parchman before receiving a lethal injection for the 1996 murder of a man court records said was shot by Simmons’ brother-in-law and then he used meat carving knives to dismember the body parts and scatter them in an alligator-infested bayou. Simmons ordered a jail house dinner that included a slew of fast food: one Pizza Hut medium Super Supreme Deep Dish pizza, double portion, with mushrooms, onions, jalapeno peppers, and pepperoni; pizza, regular portion, with three cheeses, olives, bell pepper, tomato, garlic and Italian sausage; 10 8-oz. packs of Parmesan cheese; 10 8-oz. packs of ranch dressing; one family size bag of Doritos nacho cheese flavor; 8 oz. jalapeno nacho cheese; 4 oz. sliced jalapenos; two large strawberry shakes; two 20-oz. cherry Cokes; one super-size order of McDonald's fries with extra ketchup and mayonnaise; and two pints of strawberry ice cream, according to GulfLive. The Department of Corrections reported that 90 minutes before the execution Simmons had eaten half the meal and was still eating. He sampled everything except the chips. The death row inmate’s last meal came in at just under an astonishing 30,000 calories! In the Twilight Saga: Breaking Dawn, Jacob realizes that Bella & Edward's newborn daughter is the love of his life. (sorry if I ruined it for you... wait a minute, if I ruined it for you, you need to CRAWL OUT OF THE CAVE YOU LIVE IN) Anywho... if you think that's creepy, you're RIGHT. And Taylor Lautner, who plays Jacob, has been teased by his friends, who think it's creepy too. Taylor says, "As Lautner said, "creepy." "Everybody likes to tease me about it," Lautner told Entertainment Weekly. "I laugh along with them, but it's important for me to keep in my mind that it's as simple as a lifelong bond. It's not nearly as creepy as everybody likes to joke." Uh, Taylor, yes it is as creepy as everybody likes to joke. It's creepy as hell. But we'll forgive you this once because we can crack an egg on your six-pack abs. This still from Breaking Dawn: Part 2 might seem to portray a cute conversation between werewolf babysitter Jacob and Renesmee – the daughter of Jacob's former crush, Bella – but there's an underlying storyline that even Taylor Lautner admits people think is "creepy." Because of a werewolf-related process called "imprinting," Lautner's Jacob is irrevocably (as Bella might say) tied to the child (played by Mackenzie Foy). Jacob will fill a protective, older-brother role to the child until she matures. The kicker? Renesmee grows rapidly, and will appear 17 when she's actually only seven years old – something readers don't see in the book. Not to worry, though. Jacob and Renesmee's complicated relationship will get less icky during the course of the movie when they have to fight, along with the vampires, for Renesmee's right to live. We'll have to wait to see those pictures, though: Twilight: Breaking Dawn Part 2 isn't set to arrive in theaters until Nov. 16. In other news, the final installment of Batman, The Dark Knight Series will be released on July 20th. Christian Bale admits that despite the discomfort, he will miss wearing that suit. Uh, Christian... I know one person who will happily allow you to put on your batman suit for her. Spank! That's right... the one, the only Spank, loves Batman. Did you know she is back to blogging and has her very own blog now? No? You should totally check it out. Check out "Spank You Silly"! 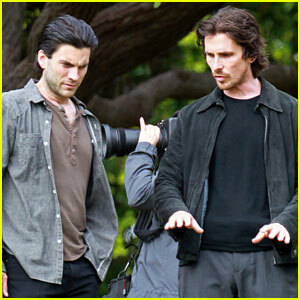 Wes Bentley and Christian Bale work on their latest movie, Knight of Cups, on Thursday (June 21) in Los Angeles. The Terrence Malick-directed drama centers around a man in search of love and truth and co-stars Natalie Portman and Cate Blanchett. Christian, 38, can next be seen on the big screen in The Dark Knight Rises, out July 20. While filming the action flick, Christian chatted with Movies.com about saying goodbye to the Caped Crusader character he’s played over the past few years. “For all the kind of discomfort, and all the heat and the sweat and the headaches and everything from [wearing the Batman suit], when you sit back and watch the movie at the end of the day you end up going, ‘That’s f——- cool!’ So, I will. I will miss it,” he shared. You guys remember the Shake Weights, right? Check out this hilarious public prank involving them! And now, for today's FAIL... I'm just a commoner. I'm not worthy of eating Royal Placenta. Does anyone have some Commoner Placenta for me to eat? No? And today's (history) WIN! I think I need to use this in homeschool. Will save me a lot of time. Robert Pattinson pulled a rear end muscle on his first day of filming Twilight. Lord of the Rings actor, Viggo Mortensen, broke two toes on camera. He turned it into a performance! The scene the break occurred in was when Aragorn (Mortensen) saw a pile of orcs and thought Frodo was dead. He kicked a helmet, which resulted in two broken toes. Instead of complaining and stopping the scene, Mortensen used his pain as part of the scene, giving a terrible yell. No one knew until after the scene that he had hurt himself, and many viewers remain unaware of it. Brad Pitt wins on ironic injuries. He was filming for Troy, playing the part of Achilles. Brad Pitt tore his Achilles’ tendon, just like Achilles did in the myth. His injury delayed finishing the film for several months. I too want to see how they play it off. It's like one of those surgery shows or a car wreck... disturbing, yet you are compelled to see it. Ginger, no offense but this was rather a lame welcome back post. Where are the cat videos and/or poorly dressed photos. And TWO (2) Twilight-related articles? What a disappointing post. Boo. Haha! You've captured Jenny perfectly! Soooo hilarious! If anyone is confused, Carolyn is channeling "Jenny" and her comment on our latest "Mommy Hates Chemicals" review. bwahahaha! OMG! This comment made my day. So ... Breaking Dawn. Ummmm I solemnly swear to put Wolf Pack packing tape over my mouth to stop from heckling at the theater. I solemnly swear to hide the Wolf Pack packing tape (yes, Spank can vouch for the fact that I have some) so that you are able to heckle at the theater! How else will we survive the movie?